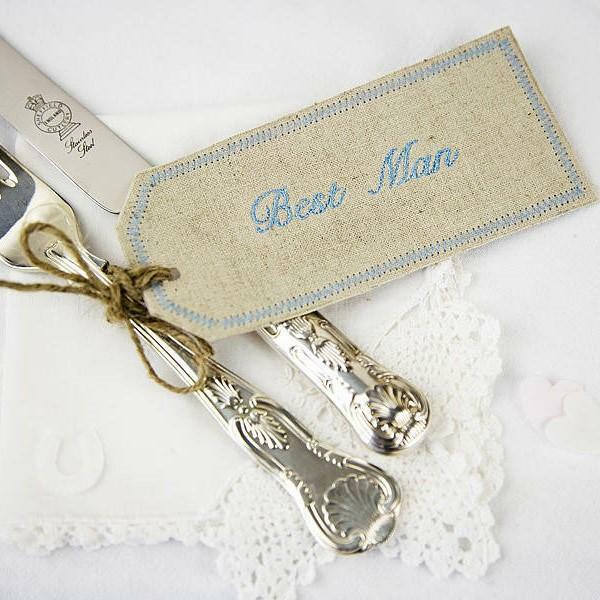 Vintage inspired embroidered fabric place setting tags. These lovely and unusual fabric embroidered tags, are inspired by the old fashioned luggage labels. They come with a length of twine to attach as you wish, try wrapping them around your cutlery or around individual small jam jars or tea cups for a vintage style wedding. Each pack will be of one fabric colour and embroidery colour. These can be personalised with up to 12 characters and in a choice of six colours. Embroidery colours; Pink, Blue, Lilac, Sage Green.